Fill out the form to read now! One of the greatest opportunities for B2B organizations with the social Web is to find, engage and convert prospective customers well before they’re actively ready to buy. The channels, relationships and content available openly across the Web make it easier than ever to build strong, scalable pipelines of near-term and future business. Of course, one of the problems with the social Web is that it’s like the biggest, best library in the world— with all of the books on the floor. 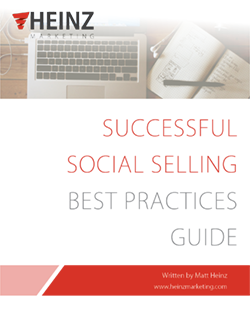 This best practices guide focuses on helping you organize, harness and capitalize on the information, buying signals and qualified prospects identifying themselves to you online every single day. With a mix of strategies, tactics and tools, the following pages will give you a head-start towards filling your sales pipeline with more qualified prospects and conversion opportunities. © 2019 Heinz Marketing, Inc. All rights reserved.